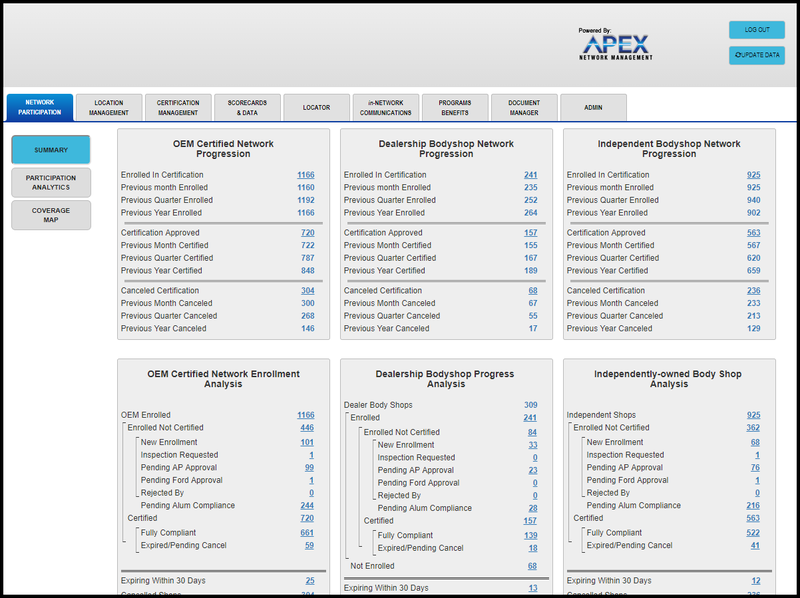 The Assured Performance Certified Network Management System is a turnkey platform available to OEMs, Insurers and other entities to monitor, measure and manage a mass market network of OEM Certified Collision Repair Providers. It is a collection of technology-driven tools that allow the users to have best in class oversight, measurement, review, monitoring, administrative approval, and day-to-day control of the numerous elements of a complete North American certified repair provider network. This system allows you to set requirements and identify those that meet your unique requirements. It provides drill-down capability to create specific optics and shape the network according to KPIs and other criteria and analytics. The Assured Performance Certified Network Management System is based on existing Certified Collision Repair Providers and all the elements related to that massive group of exceptional businesses. 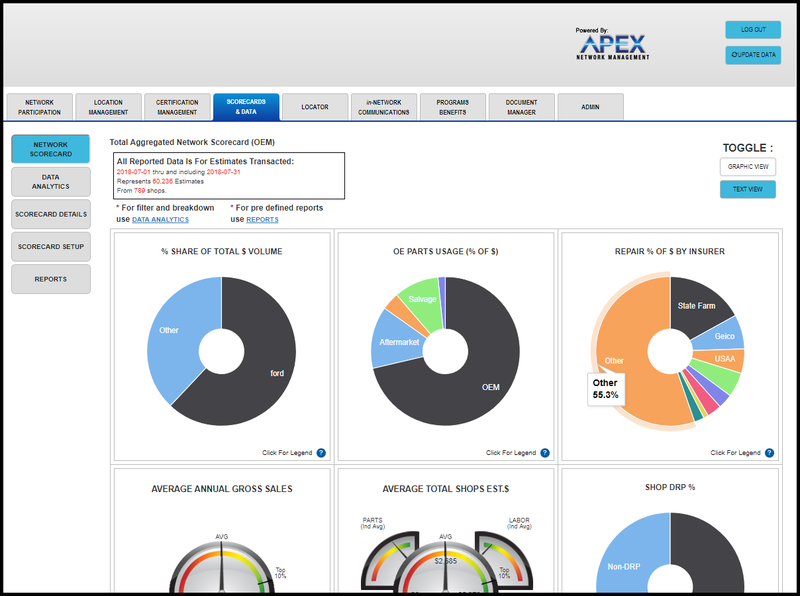 The Certified Network Management System provides unparalleled optics and control over the entire network of thousands of shops covering all North America. The tools provided allow one to craft the exact profile and coverage of the network required and then helps promote them to one’s target market customers using Smart Apps, online locators and an assortment of other tools provided. Participants can use the Assured Performance Network Management tools to use data points, UIO/Car Parc, demographics, geographics, psychographics and data smash-up comparison to shape and fill the network to meet unique needs in the marketplace. Assured Performance Certified Network Management System includes exclusive Processes, Programs, Tools and Procedures, making it the Best-In-Class Certified Repair Network Management Solution for OEMs, insurers and any other organization that wants to establish a real tangible and complete network covering North America or any region. With the exclusive capabilities offered by the Assured Performance Certified Network Management System, you tap into the largest network of certified repair providers ever assembled. Each of the shops have been fully vetted through an extensive 5-Step certification – validation process (see below) that includes numerous checks & balances to ensure full transparency and the integrity of the results and unmitigated compliance to the qualifications/requirements by each participant. And, it’s backed by a detailed onsite audit that is performed by trained on-site inspectors. Even the state-of-the-art Smart Apps with GPS tracking used by our Inspectors to validate shop applications were developed exclusively by Assured Performance to document criteria compliance.The Assured Performance Network Management tool-set delivers a comprehensive list of features and benefits never before available in the collision repair industry. The best in class collision repair businesses that make up the network provide a complete blanket of the country with a light in nearly every community.